I am a road warrior who has racked up several million miles over the past decade, and since I’m also working more-than-full-time running Automattic (a totally distributed company) and leading WordPress I need the ability to be productive wherever I can find a comfortable place to sit. 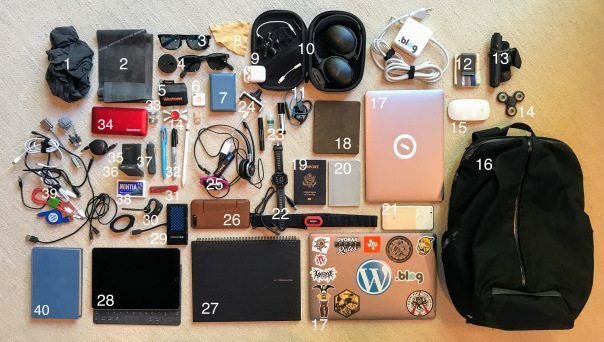 I carry a backpack with me almost all the time and obsessively tweak and iterate what’s in it, which lead to posts in 2014 and 2016. This is the latest edition, and I hope you enjoy it. Fidget spinner, I think this one from Amazon. Try one of these if you haven’t yet, they’re surprisingly addictive. If you go over to 14 on the left you’ll see a custom metal one a friend made for me. Hat tips: Zach and Xa. A pocket-sized Baron Fig notebook, which I use in meetings to avoid my phone. 9.7″ iPad Pro + smart keyboard cover on AT&T. I didn’t expect to, but I really love this device. It gives me way more joy than my phone or my laptops. Gorgeous screen, long battery life, always connect, I can tether to it, write on it with the pen in 32, the keyboard is fast and silent, split screen is handy… I don’t know how to describe it. Like the Airpods, this product just excels in every area. I still have and need to use a laptop, but it’s less of my day and honestly because of some internal tools and security stuff we have. I ended up with this beast Cable Matters USB-c mega-dongle to cover ethernet, VGA, HDMI, and old USB . Hat tip: Automattician. Two rings: one Margiala one which has my lucky number 11 circled (for a long reason related to their numbering system), and one with the WordPress logo that was also a swag prototype for a ten-year tenure gift. I might wear these to remind me of something I’m trying to remember or focus on during a day.